Imagine having an informal discussion on Diabetes, the water absorption properties of sago or how glass is made, with a Supreme Court Judge while you are still in school! Well, Al Qamar kids had the unique privilege of doing just that! Al Qamar Academy was honoured to have Honourable Justice Jb. F.M. Ibrahim Khalifullah, Judge, Supreme Court of India , visit our school on Friday, 20th December 2013. Justice Khalifullah toured the Montessori environments and saw the children working. While Nuha explained how she does subtraction, Aathif demonstrated how he splits numbers to do multiplication. Zainab and Maseerah showed their research on Mammals, while Maryam’s beautiful handwriting caught his eye. He interacted very informally with all the children, asking them questions and congratulating them on their work. The Judge also viewed the different projects done by Middle school children including diabetes research, presentation on the Egyptian civilization, an interview with Qudsia Gandhi , IAS, project on the properties of Glass, and even one on the downfall of Napoleon. Mr. Khalifullah listened patiently to each child and asked incisive questions. The high point of the visit was Justice Khalifullah’s speech to the Middle school children. He told them stories –real life inspiring stories of human beings who overcame difficult odds to succeed. Justice Khalifullah encouraged the children to dream and to work hard to make their dreams come true. He concluded his talk by emphasizing the importance of prayer. 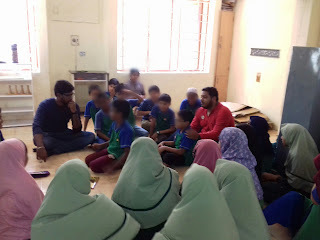 The children listened enthralled and InshaAllah will imbibe his important message. This small group of children will probably never forget the rare experience of having a Supreme Court Judge come speak to them and interact with them in such a direct and approachable fashion. “I learnt that the method of imparting education in this institution is unique and my interaction with the children confirmed my assessment” said Justice Khalifullah at the conclusion of his visit. Al Qamar management, staff and students thanks Honourable Justice Ibrahim Khalifullah for taking time during his vacation to come and visit our school.